Они ночевали в одном из монастырских покоев, который отвели дяде по старому знакомству. Был канун Покрова. На другой день они с дядей должны были уехать далеко на юг, в один из губернских городов Поволжья, где отец Николай служил в издательстве, выпускавшем прогрессивную газету края. Билеты на поезд были куплены, вещи увязаны и стояли в келье. С вокзала по соседству ветер приносил плаксивые пересвистывания маневрировавших вдали паровозов. They spent the night in one of the rooms of the monastery, which they’d given uncle for old times’ sake. It was Pokrov’s Eve . On the next day they would have to go off far to the south, to one of the big towns in Povolzhye , where father Nikolai worked at a publisher, putting out one of the progressive newspapers of the region. The train tickets had been bought, the luggage had been packed and put in the room. From the local station the wind brought the whining whistling of the manoeuvring distant trains. К вечеру сильно похолодало. Два окна на уровне земли выходили на уголок невзрачного огорода, обсаженного кустами желтой акации, на мерзлые лужи проезжей дороги и на тот конец кладбища, где днем похоронили Марию Николаевну. Огород пустовал, кроме нескольких муаровых гряд посиневшей от холода капусты. Когда налетал ветер, кусты облетелой акации метались, как бесноватые, и ложились на дорогу. Towards evening it got very cold. Two windows at ground level looked out into the corner of a tired little kitchen garden, planted around with yellow acacia bushes. Through frozen puddles went a road and at the end of that the graveyard, where that day they’d buried Maria Nikolaevna. The garden was empty, apart from a few shiny rows of turned-blue-with-cold cabbages. When the wind blew up, the acacia bushes flapped and tossed about, as if possessed, and lay themselves down on the road. In the night Yura was woken by a knock at the window. The dark cell was supernaturally lit up with white fluttering lights. Yura in just a nightshirt ran up to the window and pressed his face against the cold glass. За окном не было ни дороги, ни кладбища, ни огорода. На дворе бушевала вьюга, воздух дымился снегом. Можно было подумать, будто буря заметила Юру и, сознавая, как она страшна, наслаждается производимым на него впечатлением. Она свистела и завывала и всеми способами старалась привлечь Юрино внимание. С неба оборот за оборотом бесконечными мотками падала на землю белая ткань, обвивая ее погребальными пеленами. Вьюга была одна на свете, ничто с ней не соперничало. Through the window there was no road, no graveyard, no garden. In the courtyard raged a blizzard, the air billowed with snow. One might think that the storm noticed Yura and, realising how terrifying it was, enjoyed making an impression on him. It whistled and howled and tried in every way to attract Yura’s attention. From the sky turn after turn in endless windings fell on the earth in a white tissue, wrapping it up in a funeral shroud. The storm was the only thing in the world, with nothing to compete against it. Yura’s first desire, when he came down from the window-sill, was to get dressed and run outside, and start doing something. То его пугало, что монастырскую капусту занесет и ее не откопают, то что в поле заметет маму, и она бессильна будет оказать сопротивление тому, что уйдет еще глубже и дальше от него в землю. He was frightened that the monastery’s cabbage was being buried and they wouldn’t dig it out, that in the field his mother was being covered up and she was powerless to resist, that she was going away deeper and further into the earth. Again it ended in tears. His uncle woke up, spoke to him about Christ and comforted him, but then yawned, walked up to the window and thought for a bit. They began to get dressed. It was starting to get light. Pokrov is the “Intercession of the Holy Virgin”, but I thought translating “канун Покрова” as “the eve of the feast of the Intercession of the Holy Virgin” might break the mood. This is a translation (by me) of the first section of the first part of the first book of Doctor Zhivago (by Boris Pasternak). In the English I’ve tried to preserve from the original the bold language and especially the background coming through into the foreground. Шли и шли и пели “Вечную память”, и когда останавливались, казалось, что ее по залаженному продолжают петь ноги, лошади, дуновения ветра. On and on they sang “Eternal Memory”, and whenever they stopped, it seemed that, as if coming out from behind, continuing the singing, were the feet, the horses, the breath of the wind. Прохожие пропускали шествие, считали венки, крестились. Любопытные входили в процессию, спрашивали: “Кого хоронят?” Им отвечали: “Живаго”. “Вот оно что. Тогда понятно”. — “Да не его. Ее”. — “Все равно. Царствие небесное. Похороны богатые”. Замелькали последние минуты, считанные, бесповоротные. “Господня земля и исполнение ея, вселенная и вси живущие на ней”. Священник крестящим движением бросил горсть земли на Марью Николаевну. Запели “Со духи праведных”. Началась страшная гонка. Гроб закрыли, заколотили, стали опускать. Отбарабанил дождь комьев, которыми торопливо в четыре лопаты забросали могилу. На ней вырос холмик. На него взошел десятилетний мальчик. The last minutes slipped by, counted, irrevocable. “The Еarth is the Lord’s, and the fullness thereof; the world and all ye that dwell therein.” The priest with a baptising movement threw a handful of earth on Maria Nikolaevna. They started singing “With the spirits of the righteous”. A terrible rush broke out. They closed the coffin, they nailed it up, they began lowering it. Lumps of mud rained down, with which four spades hurriedly filled the grave. On it grew a little mound. Onto that climbed a ten year old boy. Only in the state of stupor and unfeelingness that usually comes at the end of big funerals, could it seem that the boy wanted to say a few words on his mother’s grave. Он поднял голову и окинул с возвышения осенние пустыри и главы монастыря отсутствующим взором. Его курносое лицо исказилось. Шея его вытянулась. Если бы таким движением поднял голову волчонок, было бы ясно, что он сейчас завоет. Закрыв лицо руками, мальчик зарыдал. Летевшее навстречу облако стало хлестать его по рукам и лицу мокрыми плетьми холодного ливня. К могиле прошел человек в черном, со сборками на узких облегающих рукавах. Это был брат покойной и дядя плакавшего мальчика, расстриженный по собственному прошению священник Николай Николаевич Веденяпин. Он подошел к мальчику и увел его с кладбища. He raised his head and cast, from his summit, over the autumnal wasteland and the cupolas of the monastery, an absent glance. His snub-nosed face twisted up. His neck stretched. If a wolf-cub had raised its head like this, it would be clear that it would now begin to howl. Covering his face with his hands, the boy began to sob. A cloud flew up and began to lash him in the hands and face with wet cold rain. Up to the grave came a man in black, with gatherings in his narrow tight-fitting sleeves. This was the brother of the deceased and the uncle of the crying boy, a priest unfrocked at his own request, Nikolai Nikolaievich Vedenyapin. He went up to the boy and took him out of the graveyard. Visiting museums and galleries we often pick out the guide leaflet in a few languages, and compare translations. 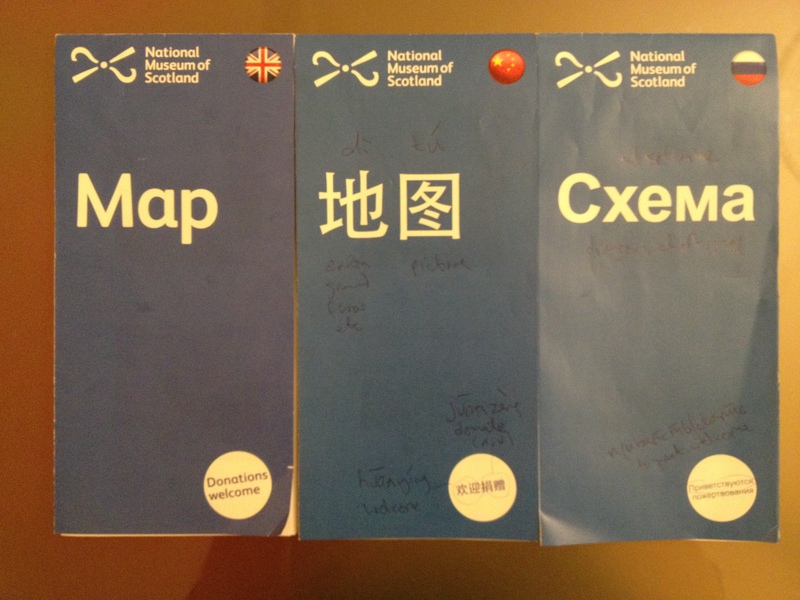 Most recently we were at the National Museum of Scotland and I picked out the Chinese and Russian versions (as well as the English). “Карта” is used for geographical maps, “схема” is used for diagrams and plans. Chinese has no word for “Scotland” — or rather, the Chinese word for “Scotland” is onomatopoeic: “苏格兰” (sūgélán). Note “land” becomes “兰” (lán, orchid), rather than for example 国 (guó, country/nation). The emotive language in the English is generally avoided in the other languages — e.g., “a selection of treasues” becomes “избранные экспонаты” (selected exhibits) — but occasionally the translators find a fitting idiom — e.g., “getting the most out of your visit” becomes “让您的参观满载而归” (ràng nín de cān guān mǎn zài ér guī). The first five characters translate as something like “let your visit be”; the final four characters is an idiom meaning (pseudo)literally “full to the brim and go back”. How do you translate something like this? The meanings in the original language are not as important as the sounds and rhythms. Синбад-Мореход и Минбад-Скороход и Тинбад-Тихоход и Пинбад-Пешеход и Винбад-Вездеход и Линбад-Луноход и Финбад-Виноход и Ринбад-Ракоход и Кинбад-Коновод и Бинбад-Шутоход и Шинбад-Чудоход и Зинбад-Обормот и Чинбад-Сумасброд и Динбад-Дремоход и Хинбад-Храпоход. Sinbad-Morekhod i Minbad-Skorokhod i Tinbad-Tikhokhod i Pinbad-Pyeshekhod i Vinbad-Vyezdyekhod i Linbad-Lunokhod i Finbad-Vinokhod i Rinbad-Rakokhod i Kinbad-Konovod i Binbad-Shutokhod i Shinbad-Chudokhod i Zinbad-obormot i Chinbad-Sumasbrot i Dinbad-Dremochod i Khinbad-Khrapokhod. Sinbad the sailor and Minbad the runner and Tinbad the sloth and Pinbad the pedestrian and Vinbad the Landrover and Linbad the moonwalker and Finbad the ?winer and Rinbad the ?crab-walker and Kinbad the ringleader and Binbad the ?silly-walker and Shinbad the ?wonder-walker and Zinbad the ?bonehead and Chinbad the madcap and Dinbad the ?sleepwalker and Khinbad the ?snorewalker. I like Динбад-Дремоход и Хинбад-Храпоход (Dinbad-dremochod i Chinbad-chrapochod; Dinbad the sleepwalker and Khinbad the snorewalker) at the end, with Bloom falling asleep. Улисс Москва, Знаменитая Книга, 1994. Перевод: В. Хинкис, С. Хоружий.